Nora was five months yesterday. I can hardly believe that she’s almost a half year old! 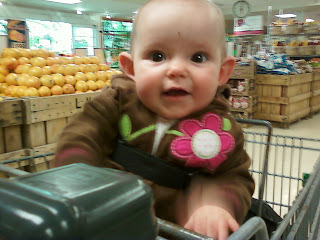 She’s doing new things every day (like sitting in a grocery cart for the first time) and is so gosh, darn amazing. Not only is she racking up frequent flier miles, but she’s talking up a storm and loving tummy time.Her favorite activities are standing and chewing…chewing and drooling, that is. She’s incredibly fascinated with Pip, stares at him, and if he gets close enough will grab his fur, so he’s learned to keep his distance. She bounces back and forth between our bed and her crib, still waking up around 4:30 or so to eat. She’s had a few nights this week where I put her in the crib sleepy but not sleeping and she went to sleep on her own without complaint, which was nice since I’m still doing quite a bit of work from home at night after she goes to sleep. We haven’t started any solids yet since she seems so satisfied with nursing, and to be honest, I’m trying to hold that off as long as possible – nursing is just too easy and I’m content with being her only food source. But, in a very short month, we’ll have to start that road which will be exciting and sad all at once. On that note – the track suit is size 6 months.